A Caesar salad has chicken breasts, romaine lettuce and croutons dressed with parmesan cheese, lemon juice, olive oil, egg, Worcestershire sauce, anchovies, and black pepper. Wikipedia. Continuing healthy eating I wanted to make Caesar’s salad for the first time. After reading in the internet 6 – 7 recipes I got an idea how it is made and kept the most important ingredients but made a new recipe, using ingredients we like and the way I thought was easier, healthier and more practical to make. I read that anchovies were not originally added to the salad so I didn’t worry not having any at home. I also left out the eggs and the mayonnaise, to make it even lighter. Although I had parmesan, I also left that out as well. This salad is perfect as a main dish when on diet and you may use your leftover chicken or cook some as I did. I seasoned the chicken with salt, pepper and oregano, added a few tablespoons lemon juice and wrapped the chicken breast in parchment paper and baked it in a preheated oven at 180 degrees C for 45 minutes. After cooking the chicken make the croutons. Cut the bread in small cubes and bake at 250 degrees using the air, for 10 – 15 minutes. I can’t think of anything better to eat when I am on diet as it is quite filling, so I’ve made this salad many times. Apart from lettuce, I add rocket, cherry tomatoes, spring onions, dill and parsley. 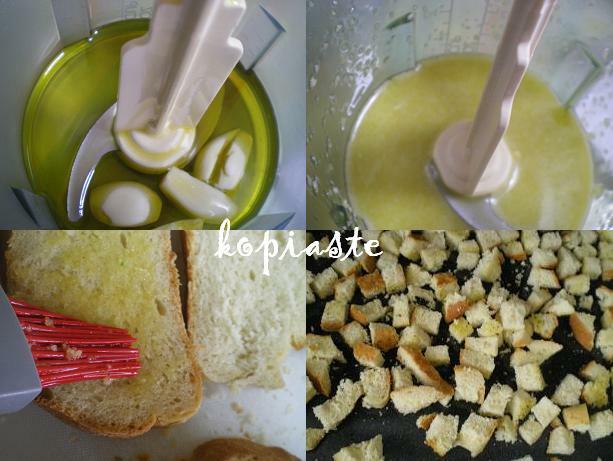 I use 1 chicken breast per person and for the croutons 1 slice of bread per person. For the salad dressing I add a tablespoon of olive oil person, 1/2 tsp honey, 1 tablespoon lemon juice, some Worcestershire sauce and balsamic vinegar. The other ingredients may be used at will. Ingredients used for the Salad Dressing: garlic, olive oil, balsamic vinegar, lemon juice, Worcestershire sauce, honey, salt, pepper and oregano. As I said, I had some leftover salad dressing and put it in the refrigerator. I also had some leftover smoked salmon filling which I used to fill the vols au vent, so I decided to combine both these to make a salmon salad. When making one of the recipes I posted the other day, I had some unused salmon fillet which I put in the deep freezer so I thawed it and I used the dressing to marinate the fillet. All I did was to leave it to marinate for about 1 hour and then I grilled the fillet for 5 minutes on each side. I then flaked the salmon with a fork and mixed in the smoked salmon filling. However it’s not difficult to do it from scratch and such a wonderful meal on hot summer days. In a medium bowl, combine the marinade ingredients and add the salmon Cover and marinate in the refrigerator for at least 1 hour. Place under a hot grill and cook for 4-5 minutes on each side, depending on the thickness of the piece of fish. Use the marinade to baste the salmon while grilling. Set aside to cool. Beat the heavy cream with a hand mixer until it thickens and then add the cream cheese and yoghurt and mix again. Flake the grilled and smoked salmons with a fork and add all the remaining ingredients and mix. Taste and adjust seasoning. Mix three quarters of the cream mixture in the salad and use the remaining to cover the fish. 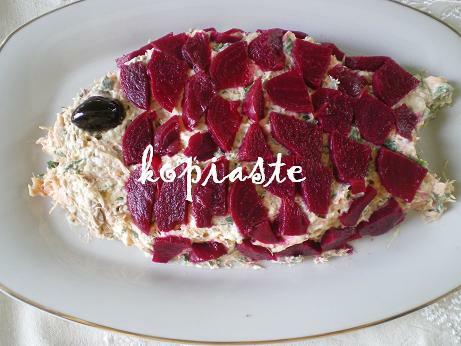 Decorate with slices of beetroot and an olive for an eye and refrigerate for half an hour before serving. I am sending both recipes to Lore, of Culinarty for her event Original Recipes. Your version of this classic looks delicious! A wonderful salad! YUM Ivy. I think I can make this. What a wonderful salad. Caesar’s gonna be thrilled at the fresh new take on this. i make my croutons just the same way, only that I cut up the bread first.Loved the personalised bit on this…just like a salad bar! The Caesar salad looks delish too, I can only imagine the crunch levels you get from it: the one from the tender lettuce leaves and the second one from the croutons. Thank for sharing both dished with the Original Recipes Round-Up! i really like a good chicken cesar. this looks lovely! That does look like a fish! Very creative my friend. 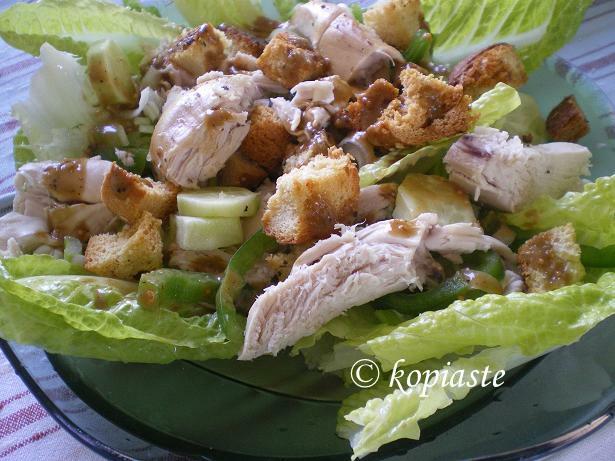 I have never made Cesar Salad at home, but when the summer comes I will try your recipe. I see that you started soon with the bikini operation ;D. I must start myself eating less than I do and exercising more… why are these things so hard? Give me this salad, the salmon and good company and I’m in heaven!!! Wowo that is indeed a very healthy looking cesar salade. I love the salmon salad! So artistic!!! I love your reinvention!! It looks so fresh and delicious. You put the leftover dressing to good use too! Both salads sound delicious! I made a salmon dip two weeks ago for a dinner party and although I thought it was pretty good, I had a lot left over so I can’t imagine my guests enjoyed it as much as I did. The flavors in your salmon salad sound much better however and I will definitely try this some time. Thanks! I’m not exactly sure when you find the time to do all this but both the salad and the fish look spectacular. I like that you made a lighter version of caesar salad – I usually avoid it because of the fat – this could work for me. This is an excellent salad Ivy! Ivy, this salad looks wonderful and I love salmon! Often, chicken gets topped on a Caesar salad to make it a meal but the salmon works well. Love the fish at the end!